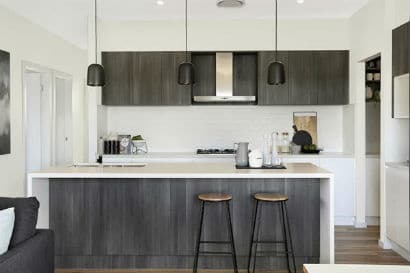 Five kitchen design mistakes to avoid! Think about the way you cook and use your kitchen. Good kitchen design features a cohesive ‘working triangle’, where there is no more than one or two steps from the fridge, to the sink, to the cook top and/or oven. Having to pace from one side of a large kitchen to the other to get to your appliances will quickly wear thin! An important and often overlooked consideration in regards to your working triangle is also the position of your garbage bins. Conceal them nicely, but keep them close to your sink and prep area for easy access! Butler’s pantries may be the latest trend in kitchen design, but they should not be overdone! There is no need to equip your butler’s pantry with every single appliance that you would find in a typical kitchen. If you do, your kitchen will become less of a conversational ‘hang out’ place as you will find yourself hidden away in the pantry for the most part! Our modern, open-plan way of living lends itself to the kitchen in particular as the conversational area where you and your friends can sit for a coffee or a glass of wine. It also allows you to interact with your guests whilst cooking, so make sure that you consider factors such as orientation, island bench generosity, and the amount of seating space. Kitchens need excellent lighting for both cooking and cleaning, so don’t skimp on it! If you’re going for pendant lights, bigger is better, and two or three are better than one. If your kitchen doesn’t receive natural light, invest in some bright LED downlights or strip lighting. Take the time to think about and plan out where your counter top appliances such as your kettle and toaster will sit. You will want sufficient power outlets here, and you may also want another set of outlets in one or two other locations throughout your kitchen for other appliances such as a blender, or even a separate station to charge your devices.